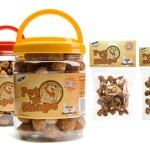 When it comes to treats, our dogs are somewhat spoiled. These last few months have been especially great for them. We had the chance to attend two tradeshows and what came with that was an opportunity to bring home a bunch new (and I’m sure tasty) dog treats. 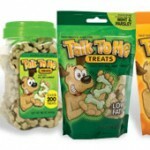 The one treat that they sniffed out first was the bag of Talk To Me Cheese Treats. These little bone shaped cheese treats are great for training. The dogs love the taste so as soon as they see me heading towards the bag, they start to follow me and will pretty much do any trick just to get one. However, just like with dog food, be sure to check the ingredients to make sure your dog isn’t allergic to any of them. 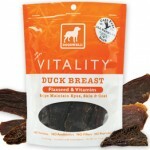 Another sample item we brought home was Dogswell’s Vitality Duck Breast. Needless to say, it didn’t last very long….they devoured it! We normally give them the chicken flavor but I’ll have to remember to start buying the duck as well. We still have lots of sample treats to give them so we’ll be sure to keep you posted on our findings. As much as they would love for us to give them everything we brought back, we are taking it slow so they don’t get sick. Are your dogs in need of some excercise?? Well they’ll love these dumbells…. I guess it’s not exactly excercise but these chick ‘n dumbell treats are one of Foxy’s favorites and they are made with 100% natural chicken with rice on a natural rawhide munchie stick. They are perfect for her because he is only 9 pounds and they are a good size treat. They are low in fat, high in protein, no additives, no preservatives and no coloring. We use them to help crate train her so she runs into her crate at night because she know that she will get a chick n’ dumbell right away. 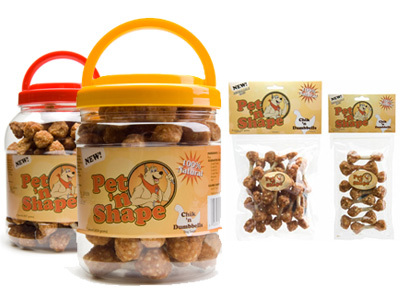 They are made by Pet n’ Shape. 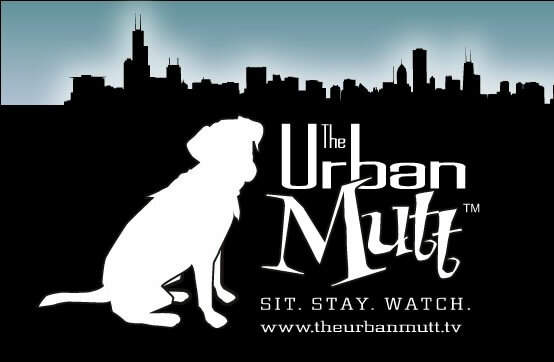 If you have a small dog, I suggest you give them a try!